It’s your opportunity to have your work picked by a team of international curators and be part of a talent scouting environment. Artists from around the world can submit their work, regardless of age, profession or gender. Celeste Prize 2013 is supported by Celeste Network, a 50,000 member social network for contemporary arts, which includes gallerists, curators, critics, art organizers, collectors and many artists. Celeste Network is a fertile environment in which to promote one’s work, make contact and start up projects around the world. 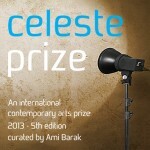 Take a look-in Celeste, you can sign up and have your free page, then decide later if you wish to join the prize.